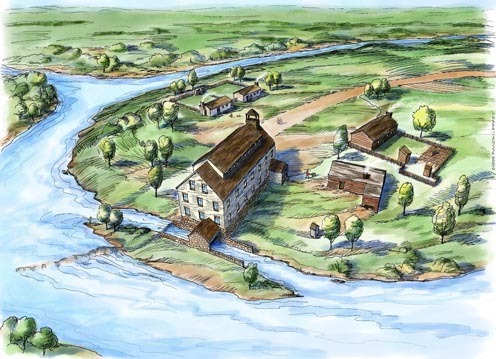 An educational textbook publisher contracted Randal for an aerial perspective map of a typical mill town for use in a textbook. Randal made up the view based upon elements required by the publisher in order to visually illustrate the textbook lesson. Randal used Fractal Painter software (now Corel Painter) on a Macintosh computer using a Wacom tablet to digitally illustrate in a line and watercolor style. The final illustration was delivered via file transfer protocol as a digital file.